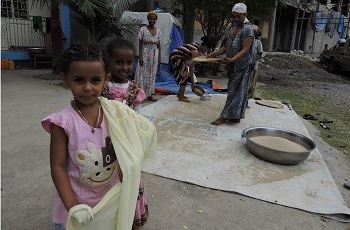 Sifting teff for sale and for domestic use to make the Ethiopian staple – injera – a sourdough bread that is served with almost every meal. There are good seeds and bad seeds. We are not talking about people, we are talking about those little things you put into the ground that grow into plants. They can yield a fabulous harvest or poor, disease-prone crops. Some people think good seeds are genetically modified because they yield better crops. In reality good seeds exist in nature. Local agricultural institutes are always working to determine what the best seeds are for the area’s crops given the terrain and weather conditions. The problem is that these tested and certified seeds are expensive so poor farmers tend to reuse seeds from their own exhausted crops. Another problem is that each seed or seedling needs particular planting techniques. The farmers that Canadian Feed The Children supports in Africa simply do not have the resources to buy good seeds and, without training, continue to use less effective farming techniques that compromise their productivity. RESULT and MILEAR, two large-scale agricultural projects running in Ghana and Ethiopia respectively, have been so successful that they have caught the attention of the Canadian government (one of their sponsors, alongside many generous private donors)! In July 2017, the Honourable Marie-Claude Bibeau, Minister of International Development and la Francophonie, went specifically to meet the Ghanaian women who are participating in RESULT. These hard-working women farmers have trusted CFTC and our local partners to lend a hand so that they can lift themselves out of poverty and create a whole new life for themselves. Ansha Oumar Seid in her field. One of these woman farmers is Ansha Oumar Seid. Thanks to using good seeds, Madam Seid moved out of subsistence farming and periods of serious hunger for her family to became a small agricultural businesswoman. She can now feed and clothe her family all year round. Madam Seid lives in a small village in the Eastern Amhara Region of Ethiopia. She is 40 years old and has seven children. Her husband, she told us last April, is unable to work so she is the head of the household. Before joining MILEAR, Madam Seid told us that she was “a daily labourer. I did weeding on other people’s farms. They paid me a small amount of money, which was not enough to cover my family’s daily needs. On my small land, I grew a local variety of teff and some oil plants, just for my family’s use. Because of my poverty, I received some governmental assistance.” When her two older children reached Grade 9 she had to stop sending them to school, even though they had successfully graduated from Grade 8, because uniforms were mandatory and she didn’t have money to buy them. 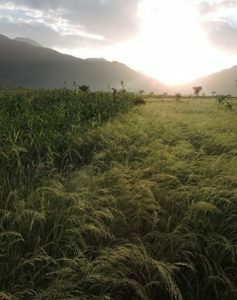 A thriving field of teff and, behind it, maize, under the setting Ethiopian sun. 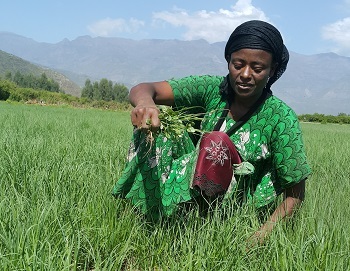 After adopting the Boset teff seed, and gaining access to a small pump for better irrigation, Madam Seid’s crops improve dramatically. For the first time she could sell part of her crop and save money. She joined a Village Savings and Loans group and was able to get loans to invest in her fields and livestock. Her livestock multiplied after she joined the MILEAR pass-on scheme: MILEAR provided 30 participants (all women) with one ram and five ewes. Once the ewe gave birth, the participants kept the offspring and transferred the mother to subsequent recipients. This program is still going on. 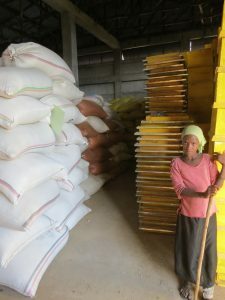 Seed storage, as shown in a warehouse here run by a seed collective as part of MILEAR, is essential to ensure efficient market access and prevent spoilage. Now Madam Seid has plans to rent land, expand her production, and trade some of her sheep for cattle as well! Seeds and livestock alone, though, could never have resulted in such a radical change. The community where Madam Seid lives is highly patriarchal. Women often are not decision makers, and do not have ownership of family assets. MILEAR would never work without gender training both for men and for women, and in some ways, gender training is the most crucial part of the whole program. Seeds don’t take hold in ground that is not ready. As are many MILEAR participants, Madam Seid is absolutely delighted about her gender training. In our interview she said, “I have got education on gender equality, which is the best lesson I got in my life ever.” For someone who has experienced so much change these are strong words indeed.